Kendra Stritch made history in 2014 when she became the first North American to win a stage of the UIAA Ice Climbing World Tour. This historic success arrived on the speed wall in Bozeman, Montana. In 2016 Kendra finished sixth overall in speed after three top ten results. 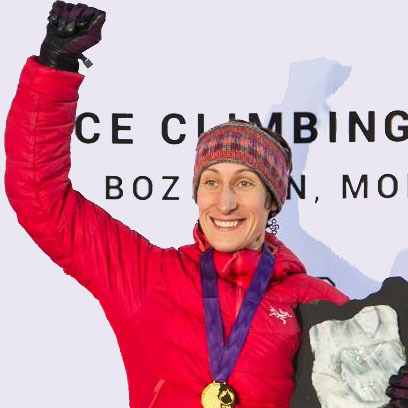 Kendra, based in Stillwater, Minnesota, began climbing in 2006, ice climbing in the winter of 2007 and joined the UIAA World Tour circuit in 2012. The cold winters of Minnesota and her passion for climbing meant scaling ice was a logical progression in her climbing. She enjoys all disciplines of climbing but you can tell there’s a little extra passion for ice. Working full-time as a Strategic Project Manager for manufacturing, she has developed her own home training speed walls made of plywood and log. She also enjoys trying out new sports and competitions such as log rolling, kickball and orienteering, and more traditional sports like skiing, backpacking and scuba diving. Kendra takes motivation and inspiration from the support of local and international communities. She is passionate about sharing all aspects of climbing with everyone; you will find her at as many festivals and gatherings as she can attend around her competition and work schedules. Kendra is also passionate about introducing more youth and women to climbing and ice climbing specifically. She enjoys sharing her knowledge through mentorship and coaching of anyone who’s psyched to learn and have fun. When Kendra’s not on the World Cup competition circuit you’ll find her climbing hidden gems around the Great Lakes or scaling multi-pitch ice and mountains in the Canadian Rockies, her second home.